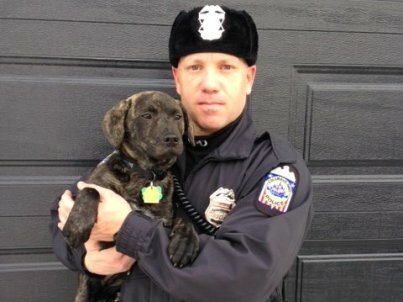 With so many stories in the news about trigger-happy cops shooting people — and dogs — it’s good to know that there are plenty of compassionate police officers in this country. Two such officers are Kelly Shay and Rodger Nolan of the Columbus Police Department (CPD) in Ohio. Both of them recently went out of their ways to help puppies instead of harm them. Bravo to these heroes! While Kelly Shay was on patrol in May, a woman flagged her down. She said she had seen a man dump a puppy in a trash can near an elementary school. Shay pulled the puppy out of the trash. His right front leg appeared to be broken. “Ofr. Shay took him in her arms, [and] got a rescue to cover his medical bills,” according to the Columbus Division of Police Facebook page. Shay became the puppy’s foster mom as he recovered. She named him Oscar — after the Sesame Street resident who lives in a trash can. “ANOTHER DAY, ANOTHER CPD OFFICER RESCUES & ADOPTS A PUPPY!” says a Columbus Division of Police Facebook page update on Nov. 21. Earlier this month, Officer Rodger Nolan was at the scene of a bad car accident on the east side of Columbus. Trapped inside the wreckage was a 4-month-old, mixed-breed puppy. Nolan managed to pull her out to safety. For unknown reasons, the puppy’s owner decided to surrender her. 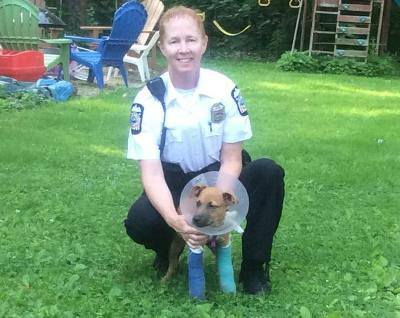 “Officer Nolan fell in love with her instantly,” according to the CPD. Nolan later managed to talk his wife into going with him to the Franklin County Dog Shelter & Adoption Center, where the pup had been taken. There they officially became the four-legged crash survivor’s new pet parents. The pup, who they named Camden, is already becoming BFFs with the Nolans’ other two dogs, a Great Dane named Shea and Boxer named Wrigley.